Dan Hellmer Racing Solutions offers same day shipping on most orders of in stock items ordered before 3:00 pm central time Monday thru Friday. No orders are processed on Saturday or Sunday. We currently do not ship outside of the USA. Items marked Free Shipping will qualify for free ground shipping or other method of our choice in the contiguous United States only if the order is over $99. Items that qualify for free shipping and the order total is under $99, these orders will ship with standard shipping fees. Products not marked for free shipping are shipped with "True" to your door shipping fees. Orders over $750.00 will require a signature for delivery. All orders shipped by FedEx excluding truck freight items. Additional charges may be applied for oversized items. ORM-D items, lithium or car batteries, oils and lubricants or any other hazardous materials must ship by ground and may not be eligible for free shipping and may incure a additional hazardous material fee. 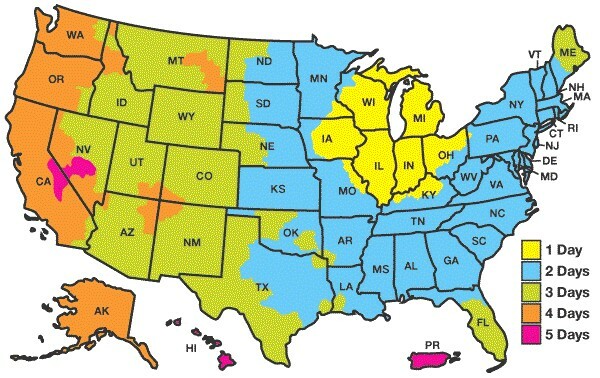 Use the Scheduled Delivery Days Map to determine the estimated ground delivery time of a package. The map represents the routing and the number of days to allow for an order, based upon your geographic location.